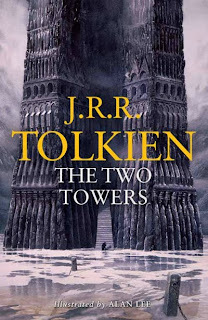 I am a bit late, but here are the answers to the questions for the second part of the read-along of The Two Towers. I am very impressed with myself that I am managing to continue this rereading. I am very hopeful it will continue into November when The Return of the King is read. Fangorn Forest, of course. I am not so crazy about being underground when I can spend time in a new forest. I have mentioned before how I really like trees, so it is the natural answer. I also love the Ents, so hopefully if I visit their forests I would get a chance to see them. That being said, the caves have their appeals, too. While I might not pick that as my first choice I would still be willing to visit. I enjoyed that the characters were split off enough to get a chance to get to know them better before being brought back together. Sam and Frodo will be off on their own for a while, but I am not only interested in them. I enjoy learning more about everyone because in the first book they were mostly always together, so you didn't get a chance to really know them. That being said, it is also nice that they are back together again. I think it was done well. They had their time apart, but now it is time for the story to move forward. I find myself picturing Aragorn, Gimili, and Legolas arriving to find Merry and Pippin alive. They had been told they were, but to actually see them made for a nice moment. 3. What are your thoughts about Galdalf’s confrontation with Saruman? It was actually a bit anti-climatic when you think about it. I was almost disappointed with it. It made sense to a point, but I wish something more permanent came of the situation. Saruman is a wizard and even without his staff, he could cause trouble. Yet, Gandalf walks away and leaves him in a tower guarded by Ents. They might be big and powerful themselves, but you have to know that Saruman is left a presence in the book for a reason. 4. We learn a great deal about the Palantiri in this section. How do you feel about Saruman given Gandalf’s speech about the use of the Palantir? Would you, like Pippen, be tempted to look in to see what you could see? I enjoy with the books that we get a better chance to learn about the Palantiri. It turns out to be connected to Aragorn and his line of kings. In the movie it is just a communication device that Pippin becomes a bit obsessed with. This more detailed look makes it come alive for the readers and makes the use of it even darker. I am not sure if I would be tempted to use it. I suppose since things were not explained about it to Pippin at the time, that made him even more curious. They do say that curiosity killed the cat, but there are also problems when you keep secrets thinking they are beneficial to all. I probably would be curious, but not sure how much further I would go. 5. What are your thoughts about Smeagol/Gollum in this first part of his journey leading Frodo and Sam? For those of you who’ve seen the film, are you hearing Andy Serkis in your head when you read Gollum’s lines? I always thought that Gollum was written really well. He really comes to life for you while you are reading these books. You know you shouldn't trust him, but you also know that things are rather hopeless without him. It makes for an interesting plot device. Plus, without Gollum along for the ride, the sections for Frodo and Sam would be a bit dull. There is not much to look at and they keep getting lost, so it is better to have that underlying current of suspicion and dread. It is also interesting to see how Sam reacts to Gollum because he is so reserved in other ways. And, yes, it is hard to read Gollum and not picture Andy Serkis. He did a really good portrayal of Gollum that matches the character almost perfectly. 6. Sam and Frodo are not traveling in the most picturesque part of Middle-earth. Which would you find worse, the seemingly impossible to leave mountains or the Dead Marshes? That's a good question. In the movie, the Dead Marshes were really rather creepy. They are some of the scenes that made a lasting impression on me. That doesn't mean I would necessarily want to see them up-close, though. The mountains offer less to look at, but the Marshes have the added peril of luring you into the water. So, while the mountains are dull to look at, they are probably overall preferable to the Dead Marshes. 7. Tolkien introduces us to a lot of places in this section of The Two Towers, many just getting a mention in passing. What do you think of Tolkien’s place names (Minas Morgul, Isengard, the Emyn Muil, and on and on)? Do any stand out to you? Are there any that you don’t care for? I always loved Gondor and Rohan when I read these books originally. Then, the movies came out and they were played out on the screen. I was always a big fan of horses, so liking a culture that is based around horses made a lot of sense to me. I do know that when I read the actual names, though, I was always worried I wasn't saying them right. With these read-through I have seen the movies, so there are no problems with the crazy words. Tolkien was good about making up words that sound a bit different without going too crazy. I appreciate that about him. I wrote up this second part and then never posted it. Oops! So, here is the third part of the read-along as well. Faramir strikes me as a noble, intelligent fellow, especially concerning powers beyond his control. Had he gone to Elrond’s Council instead of Boromir, how might the story have changed? This is an interesting way of looking at things. I always liked Faramir more than Boromir, so I would have been very happy to see him throughout the book. Not to mention in the movie! I thin it would drastically change the events of the book, though. Faramir refused to even see the ring, but he was only around it for a short period of time compared to Boromir. It may have got to him after a while just as it got to his brother, but then Aragorn would have followed Frodo to the end and I don't think it would have bothered him at all. It is really hard to say. If Faramir had handled things differently than his brother, it is hard to say what would have been the effect on Fellowship. Frodo was contemplating leaving the group before Boromir went a bit 'freaky', so he still may have. I like how in the movie Aragorn understands that Frodo has to go and lets him. In the book he can't even find Frodo, but Sam figures out where he is and runs to him before he can get away. Then, there is Merry and Pippin. They were Hobbits, but they still could have had a worse fate if Boromir hadn't been there to protect them a bit. But then they also wouldn't have had the guilt of Boromir's passing and his passing wouldn't have lead to the problems with his father losing his mind a bit. A lot could change, but then it could also stay the same, too. Ultimately, though, the brothers were both concerned with the same thing, so they might have reacted very similar in the end. What did you think of Shelob and her lair? Would you willingly go in there? Yes, I know Gollum says “this is the only way”, but Frodo could have demanded they explore and attempt to find another way. Well, I actually don't entirely believe that it was 'the only way'. I always sort of figured that Gollum tricked Frodo into going that way so that he could have the ring once Shelob was through with them. He vanished just before it happened and it is sort of implied that he was a regular visitor to Shelob. At least that was my impression. So, I believe it was a trap and there probably was another way to go where they needed to go. Frodo, though, seemed to trust Gollum a bit too much. He didn't really question anything that he did all that much and there were obviously moments where he should have. Sam even overheard conversations between the 'evil' side of Gollum and the 'nicer' side. He knew Gollum was not to be trusted, but ultimately it just seemed to be a way for the reader to find out the truth about Gollum. When Sam saves Frodo from Shelob, he finds himself in the vision he saw in Galadriel’s mirror. Knowing the future isn’t always as helpful as one would think, is it? Nah, that's why I don't buy into fortune tellers and all that jazz. Even if I believe what they do is real at all, there is always interpretation. They could see you laying down in a strange place sleeping and say you were dead. Sam had a vision of the future where Frodo was laying down in a funny spot. When he saw the vision he assumed Frodo was dead in it, so when he saw it played out right in front of him he jumped to the conclusion he vision was playing out. If he had never had the vision he might have actually taken more time to determine whether or not Frodo really was dead. Having always been a sidekick/helper of sorts, Sam reluctantly realizes he may have to become the Ringbearer. What do you think Sam will do with the Ring of Power? If you were the sidekick of the hero, and suddenly had the opportunity to become the hero, to finish the quest, what would you do with the Ring of Power? I know that Carl, for example, really likes Sam. I think when I read the books for the first time I really liked him, but then I watched the movies and he annoyed me. Now I am not entirely sure if he is annoying in the books; or I am just annoyed from memories of the movies. It is one of those things, I guess. The point is I am a bit cloudy when it comes to my impressions of Sam and what he would do. One thing that I do like about him with this reread is that he is not quite as trusting as Frodo. He knows that Gollum is not exactly the best guide in the world, but he also knows that they got lost without him. Frodo seems to trust Gollum too much. Sam also knows that the ring needs to be destroyed and he wants to go home. I think for that reason he probably would have finished the mission. He thinks very simplistically. I don't believe it comes down to being a hero or a sidekick. He just does what needs to be done. If he wasn't quite so obsessed with Frodo, I would have liked Sam. He just grates on my nerves. The conversation between the two Orcs at the end was highly amusing for me. Yes, it serves to educate Sam on Frodo’s condition, and Tolkien could have just left it at that, but he didn’t. The Orc’s commiserating could have been any soldiers in any war. To me, it felt like Tolkien was humanizing the enemy, instead of the traditional dehumanizing of the enemy that you usually see in war stories. What do you think? I think that no matter what Tolkien says, he was inspired by the War. He knew what it was like to be a soldier, so it is hard for him to not be thinking with a soldier mentality. If you look at this book from the viewpoint of the war, you can easily see the battle of the good verses evil. When war happens it is still people. They might be from the 'enemy' nation, but they are still fathers, sons, daughters, wives, etc. When you are in a battle, you probably try not to think about that, but in the back of your mind you probably cannot help remembering this fact. It is partly why soldiers have so many psychological problems when they return from the war. Tolkien had seen war. He created the Orcs as his 'bad guys', but even he cannot help showing the more 'human' side of them. I have always believed that Tolkien was using these books to make people see war differently. It may not even be a conscious thing, but it is something I have always believed. The book ends on a cliffhanger. Are you excited to finish up the trilogy and see how it all turns out? Yes! I am so happy that I have managed to reread this trilogy so far. I have wanted to for years, but just never made it happen. Now I am actually doing so and it is so much fun to revisit the books. I know what is going to happen in the end, but I have really enjoyed the little details. There are many things that have happened that I didn't remember because they were changed in the movies or left out. It is fun to finally be refreshing my memory even though the main story is the same. Plus, this reread has given me a new appreciation for the overall story. When I read it before I saw it as 3 individual books, but it is ultimately one book divided into three volumes. When you look at it that way, it makes up for the slower parts. I always considered The Fellowship of the Ring the weaker book, but I didn't this time around. I am enjoying this change of perspective and look forward to The Return of the King because it was my favourite of the three when I read the trilogy before. I might even appreciate The Hobbit now. I skipped that book this time around because I just did not like it, but I also was not reading young adult books back then. I might reconsider and reread it. I thought the Boromir/Faramir question was really interesting. Like you said, if Faramir had joined the Counsel instead of Boromir there would have been so many changes. 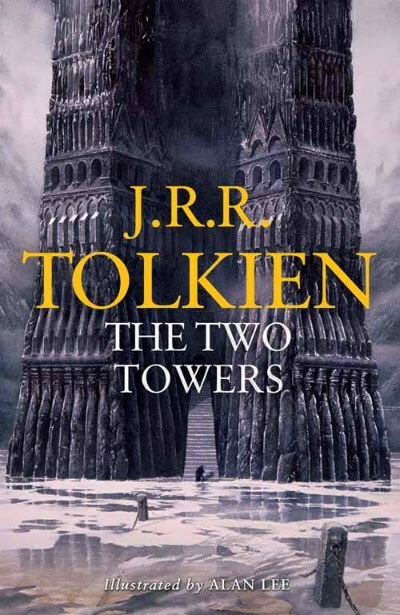 In fact it would have probably been a completely different book - perhaps somebody should write an alternative Lord of the Rings novel (bit like a Sliding Doors thing) where people take the alternative route and see how it plays out - so instead of going through Moria the Fellowship headed for Minas Tirith, for example! I actually do like Sam - although out of all the characters in the film I find Frodo and Sam the most irritating! Less so with the book but like you mention I think Frodo took his trust of Gollum too far. I thought that when Sam had seen the vision of Frodo he thought he was sleeping and that's why he didn't trust his instincts - he thought he'd misread the vision and Frodo was really dead - is that wrong? Perhaps I read it too fast? Doh. Like you, I'm so pleased I've read this again - my remembrance of the story is so intermingled with the film that rereading it gives a bit more clarity. I think I will definitely pick the Hobbit up to read - particularly as the film is due out next year and it looks really good! I too like how we get to learn more about the individual characters by them being separated. Each get their chance to shine either individually or as part of a smaller group. I actually thought the confrontation between Saruman and Gandalf was pretty power packed. Gandalf was not going to harm him in any way. It had already been established with his attitude about Gollum that he would not do anything to harm anyone but true enemies, and although misguided I'm sure Gandalf hoped that when all was said and done that he could come back and reason with Saruman. In the extended edition of the films we get a little more idea about the palantiri, but you have to know what you are listening for. There are scenes in ROTK, not just with Aragorn but also with Denethor when he is talking with Gandalf and he makes mention that he has ways of seeing what the enemy has been up to. I hadn't thought of it that way, but you are correct, Gollum certainly makes those sections of the book interesting. And I'm with you in that I think it is an interesting plot device that a character like Gollum ends up being so integral in so many ways to the progression of the story. Yes, the orcs talked about how the saw Gollum come and go from Shelob. I never interpreted "the only way" as the idea that there was no other way, but I do believe that in relation to Frodo needing to get there quickly and with as little chance of getting caught as possible it is indeed the "only" way. After all, Gollum had no interest in the Ring being captured either and so any other way which would have that possibility is one he would avoid. He of course had his agenda and I think both Sam and Frodo had the idea because of what Gollum said earlier that he would try to take it, but Frodo was getting weaker and tired and Sam was too often focused on Frodo and I think that is what had them both with their guard down during a time when they should have been most suspicious. I know I would have been suspicious, and probably terrified, to go into a stinky dark cave. Especially with someone like Gollum, let alone whatever else might be inside. I'm with you in that I think Sam seeing that vision actually clouded his judgement when it came true. I still don't understand what you don't like about Sean Astin's performance of Sam in the films. I think he did a tremendous job. He kept Sam from being a silly oaf and conveyed the loyalty of Sam so well. But of course that is just my opinion. I don't think Tolkien ever denied being influenced by what he had been through in the war, he was adamant about the fact that his story was not written to be some sort of allegory that represented either WWI or WWII. I think the part where Sam talks about the dead guy and where the orcs talk are a direct influence of the way he felt about seeing men die in the trenches for a war unlike any other way before it that in his opinion was fought because of the decisions of men who were not out on the battlefield dying. I think he humanizes the people involved in both sides of the war more effectively than a lot of other writers have. You and I had the same experience with Fellowship this time around. It was actually the most surprising thing for me so far. I couldn't believe how much I gleaned from reading it this time. It just came alive for me this time. I'm so glad we are both finally rereading this and doing it together. I love how Tolkien creates a whole world inside. Although I wonder if the places mentioned in passing will be in The Silmarillion? I think these details, likes the places we don't know about, are a nice touch to really recreate a world, because to me anyway, it creates a sense of space.